Home » Blog » CSR Advisors in Vogue !!! This leaves the companies with demanding Masters in Social Work (MSW) graduates as CSR professionals. The lack of talent and certified professionals has left most of the CSR positions being held by people holding HR/ Marketing/ Corporate Communications/ Operations positions in the company. A leading professional in CSR sector said that “These days anyone in the cocktail party says he/she is a CSR Consultant” wherein the people have left management/NGO job of a decade and ventured in CSR field. It’s a hodgepodge on whom to believe when we don’t have any accredited certified course by Government and no one to verify authentication of individual CSR Consultant or company. Corporates are in bewildered state most of the time surrounded with the perplexity of where to use a consultant and whom to use? This has indeed created a merger of 2 Cyclones – claimed/ real CSR Professionals and the Corporates! 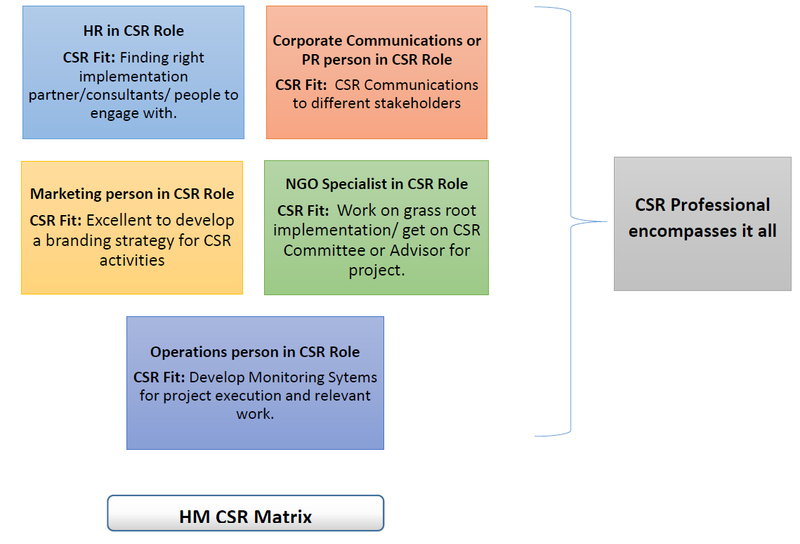 The generic notion that anyone is distinguished to become a CSR Professional needs to be evaded on a priority basis to build transparency in the field. How does one become a CSR Professional then??? Yes, but who designs the curriculum is a question! The field is dynamically evolving and has no set National or International standards. Thus, it becomes obscure for one to understand the nitty-gritties of the field. CSR Professionals are the one’s with a fusion of background knowledge in Management, Law, Environment, Finance, Social work et al. Absolutely Yes! This is one of those fields in which you learn more on the field. It enables you to create innovative theory for the future genres to refer and make your name. How do you choose the right talent to work with? The best bet as I earlier mentioned are the fusion people from social and management background not the exclusive. But of course, the person has to be well versed with other subjects such as Law, Environment Science and related in more details. We need people who would make CSR Sustainable with their management acumen and understand the ground realities compassionately with their social background. The challenge is we still have to develop such curriculum which is relevant and would mould the future minds in CSR. Is the board genuinely interested in CSR or just covering the irresponsible acts? Is the top management involved? Is the corporate willing to do genuine CSR or the norm of giving away and cheque book philanthropy? Are they considerably willing to respect your work?